I hope you have had an amazing Christmas (so far) and your Boxing Day is a nice relaxing one. 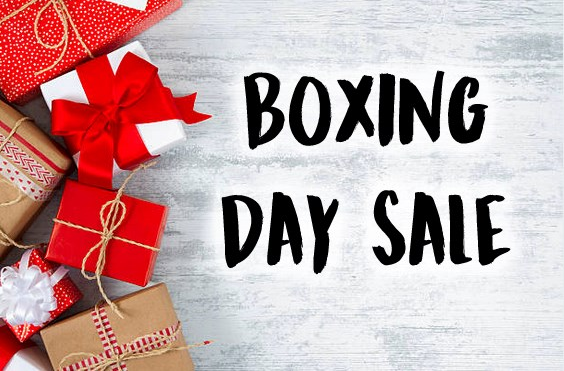 Of course it wouldn't be Boxing Day without a Boxing Day sale now would it! Do you have Christmas spending money burning a hole in your pocket? he he! 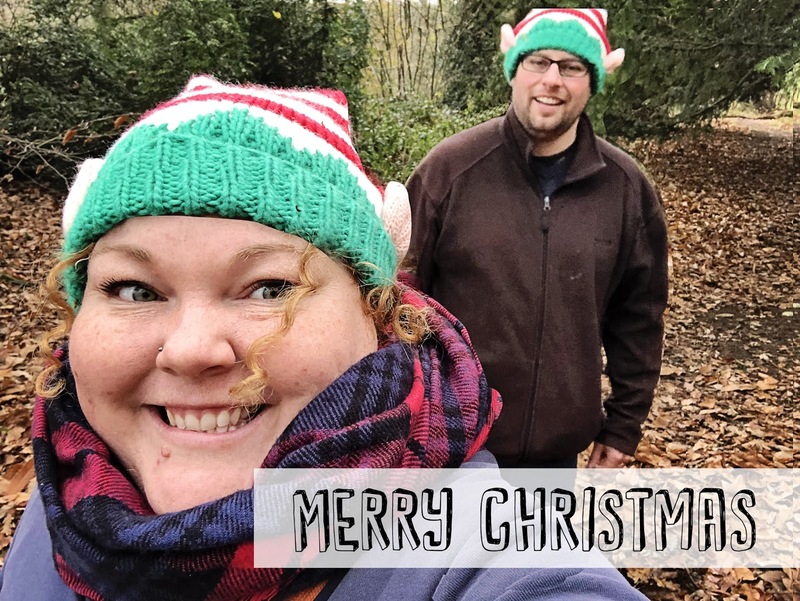 We are still open and will still be processing orders during the Christmas to New Year Week although our next postal collection is 2nd January 2019. ALSO.... did you know that the sale is store wide so that means you can also use the code not just on physical products but also on any of my online courses. No minimum order quantity - order as much or as little as you like. Please make sure you use the coupon at time of purchase as the discount cannot be given after the transaction has been made. Excludes items already in the sale section. Available internationally. Available from 26th December 2018 until the end of 1st January 2019- remember we are UK based so this is GMT! Coupon cannot be used in conjunction with any other code or coupon. Phew! That's that done lol! Now sometimes during sales the website can go a bit crazy. If it tells you "not enough stock wait 15" this means that stock is very low and that people in front of you have it in their carts waiting to check out. This may keep recurring if people keep adding, you will be in a queing system waiting to check out, you may literally miss it each time and that does unfortunately happen sometimes with popular items. We just ask customers to be considerate and either check out or release the item for people who would really like it. Please be patient with the website it has a lot of work to do and Mr B is working to keep it up and running as best as he possibly can. Anyways I will let you get back to your choccies and Carry On films! Can you believe Christmas is here! Amazing! When I was a child it seemed to take an eternity in between opening each door of the advent calendar and now as an adult the time seems to whizz by and I don't get to do all of the things I would like to do despite my best efforts at planning! Whatever you are up to I would like to wish you a very Merry Christmas) or holiday of your choosing if indeed you choose to celebrate) from my little family to yours. I would also like to thank you all for your support throughout the year, whether that is watching little old me on YouTube join me on Patreon or subscribing to a Brimbles Box. All is genuinely very much appreciated and I love you all. What an exciting year it has been! Mrs Brimbles celebrated 5 years of being a business back in April. We celebrated with a month of challenges, prompts and giveaways over in the Facebook group. I really hope you enjoyed taking part in all of the festivities as much as I enjoyed putting it all together for you. Talking of birthdays, I also celebrated being on Patreon for a year back in the Summer. I love my little Patreon community as I get to continue to create art that I love as well as interact with like minded individuals, something I don't get to do that often 'in person'. It is with the support of my Patreons that I am able to continue to make YouTube videos for general viewing and prompts etc as this means I don't have to find alternative employment. The Brimbles Boxes came back by popular demand as both a recurring PayPal subscription as well as stand alone boxes. I am humbled and honoured that you guys love my illustrations and I love seeing what you create using my products. I literally smile and do a happy dance when I see that you love them too. I have never been about numbers because I genuinely share because I enjoy to do so. It started off as a hobby and it has just grown from there but it is still something that I continue to enjoy. If you know me you will know that I will put a video up if 5 or 500 people watch it because it is my passion and I so enjoy it. My YouTube channel has continued to grow steadily as well as my instagram account. Although I am not about numbers, I am kind of hoping that I might reach the 20K mark by the end of 2019 lol. So that's it for now and almost for 2018 too! 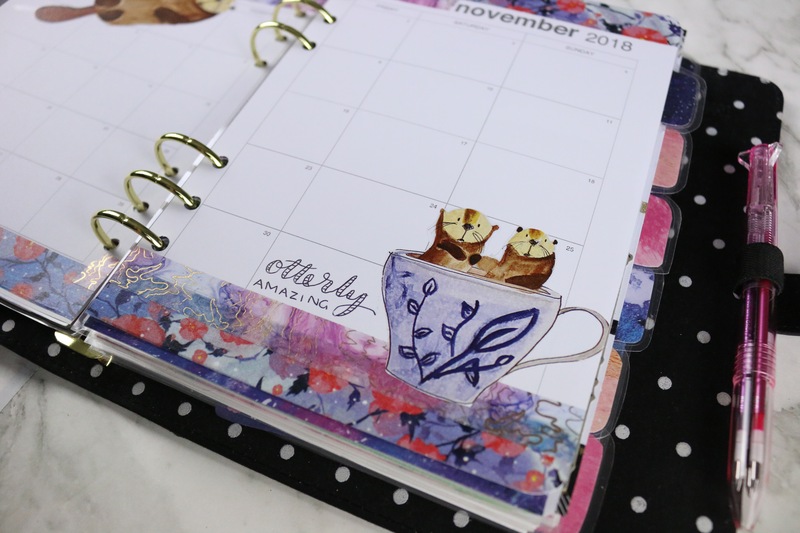 I will see you in the New Year for more journal and planner fun! If you find yourself at a lost end over the Christmas break and wanna chat with other planner nerds and journal junkies don't forget to come over and join us in the Facebook Group 'Mrs Brimbles Happy Place' we are over 3,500 members now which is so exciting. We would like to take this opportunity to wish all of our customers, followers past, present and future a very Merry Christmas and a Happy New Year. Thank you so much for supporting our family and our little business, we appreciate each and every one of you more than you could possibly know. Righty-o me dears, just to let you know that our shops (www.mrsbrimbles.co.uk and www.etsy.com/shop/mrsbrimbles ) will NOT be closing during the festive week. So you will still be able to browse and make any purchases you wish to make. However we will not be having a Royal Mail collection again until 2nd January so any orders placed during that week will be despatched then. We will still be around to answer emails etc should you need us. 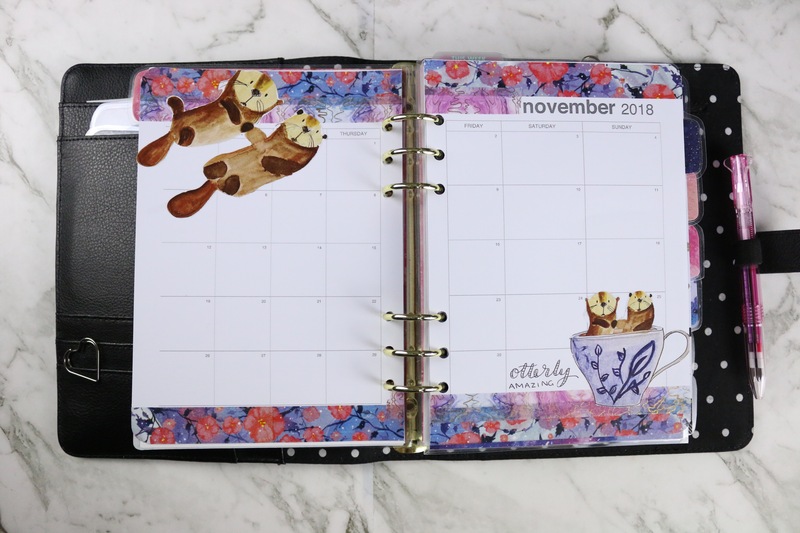 I have a flip through for you of my December Daily or my fextive journal, whatever you want to call it lol! This is days -1 to 14! This was a pretty simple layout to create - all I needed were some washi tapes and the printable from Anna's Patreon account, from which I just fussy cut out the images. 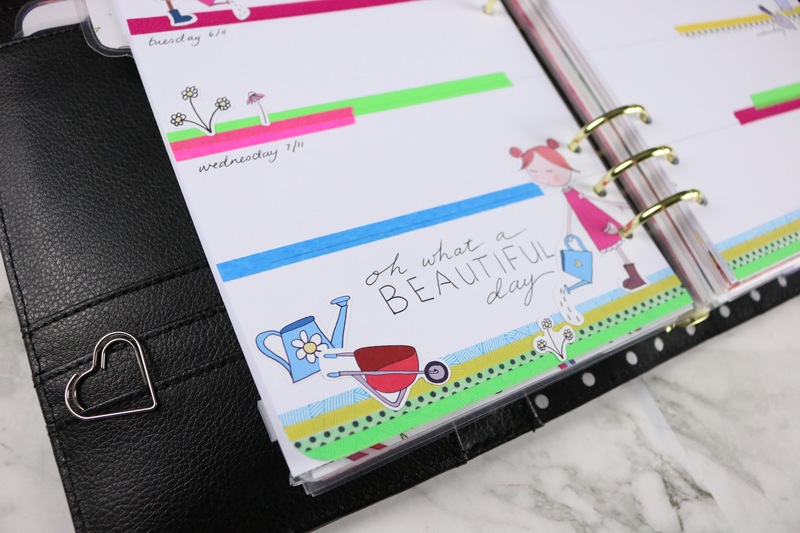 I wasn't too worried about the whitespace (it's my planner, it's for me, and I don't get hung up on too much perfection... otherwise I would be a lot more stressed out on a daily basis!). All the washi tapes are ones I have collected from various places including Etsy and instore here in Australia and I picked them because the purple-y tones matched the purple on the teacup. Look, otters in a teacup! 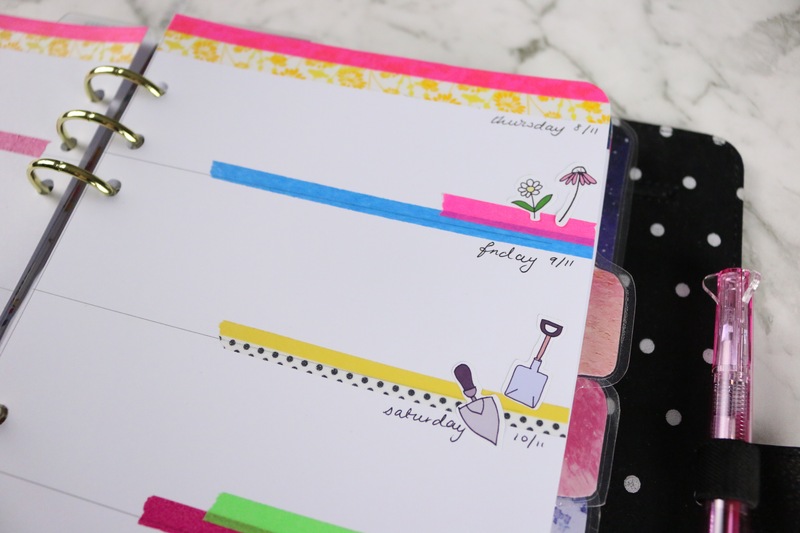 My layout is a monthly layout on two pages that's my own design and works for me, with larger boxes for Saturday and Sunday because those are usually my busiest days in my personal planner (my work planner is usually weekday heavy, naturally) and I wanted something relatively crisp and clean and easy to work with. A few strips of washi, a bit of glue for the cut-outs and some hand lettering to add a tiny bit more interest and I was done! How do you like to plan? Do you like stickers? Cut-outs? Minimalist? A combination of any of the above, or something completely different? I love switching it up on a regular basis. I find it keeps life interesting and makes my weeks a lot of fun. If you like this video, you can find plenty of other planner layouts (over three years' worth now!) on my Youtube channel. 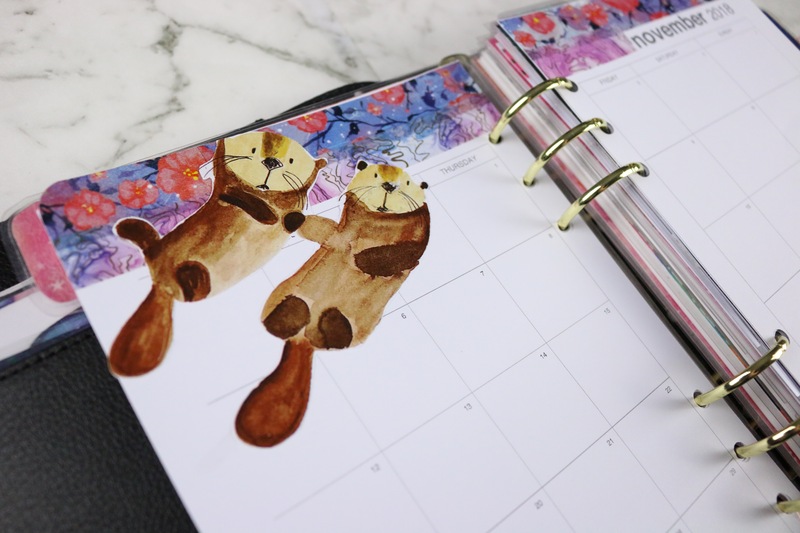 Have a wonderful week, planner friends! Well, it certainly has been a while since I last posted. I have been following and loving all the bits you guys have been sharing over in the Brimbles Facebook Group but I've been a bit AWOL. 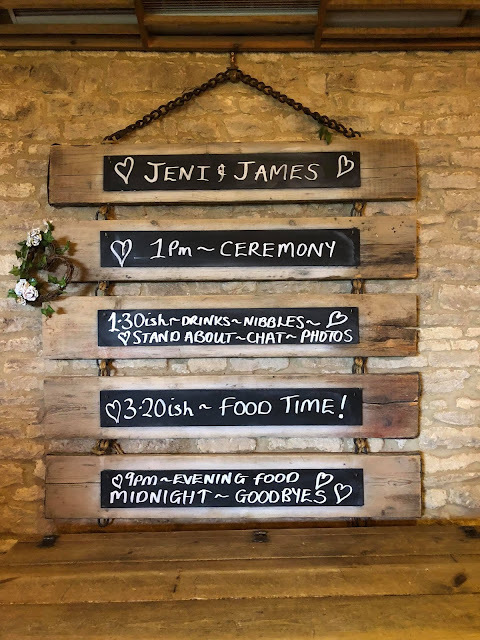 I got married at the beginning of October (yay!) so most of August and September saw me working away on candles, decorations and my bouquet as I decided to undertake most things myself. Phew! It was stressful and hardworking but boy did it teach me a thing or two! For a while I've been struggling with creativity and I've continuously hit a block whenever the creative mojo strikes. 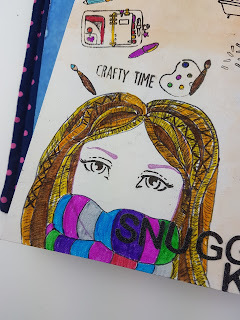 I've had to learn to love and enjoy the process of crafting again, sometimes working creatively for you business can, sadly, sometimes starve and taint the artist within. The process becomes clinical, and unfortunately I have lost some love for it. Since the wedding though, I feel rejuvenated and I've decided to dedicate some more time for creating just for me. I've taken a couple of weeks off, closing my shop to create purely for me and to push and explore some ideas I'd placed on the back burner. 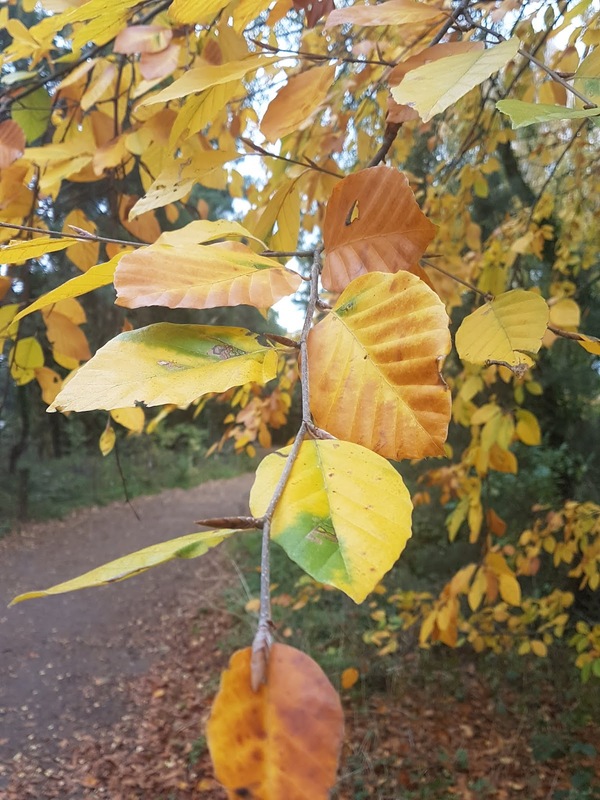 Autumn is probably my favourite season, with Winter coming an incredibly close second (mostly because of CHRISTMAS!). 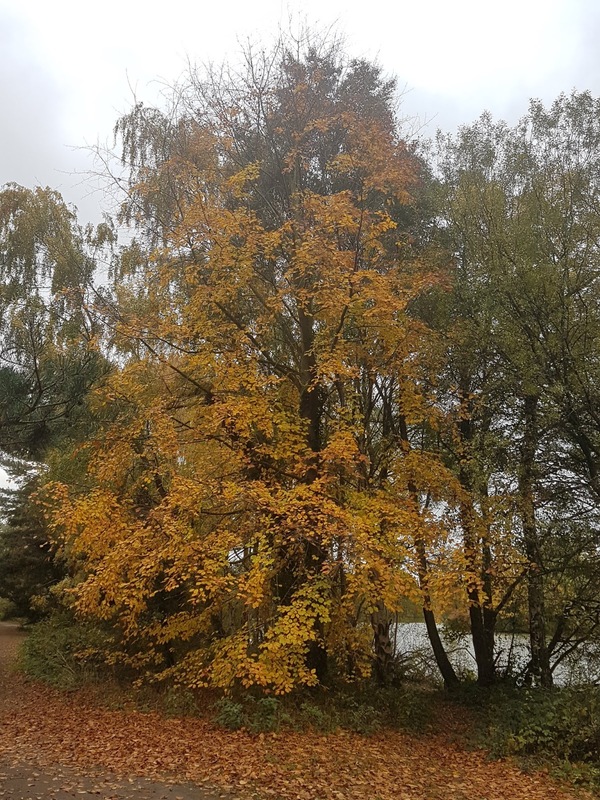 It's all the magical colours, the slight chill in the air, the feel of forthcoming rain, the squash and crunch of leaves underfoot. It is like the world opens up, and comes alive, shedding itself of what has come before and preparing itself for the new beginning in Spring. I feel like my soul vibrates to a different tune during the autumn, like I can breathe again. I can feel the inspiration bubbling away under the surface. 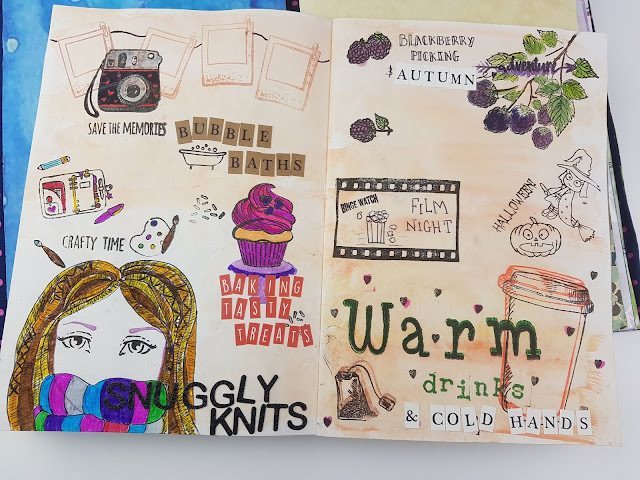 Following Anna's Autumn Doodle from last month's Patreon collage sheets, which pictured all her favourite things about the season, I decided to fetch my stamps and felt tips and give it a whirl. It feels like it's been a very long time since I did any of this! 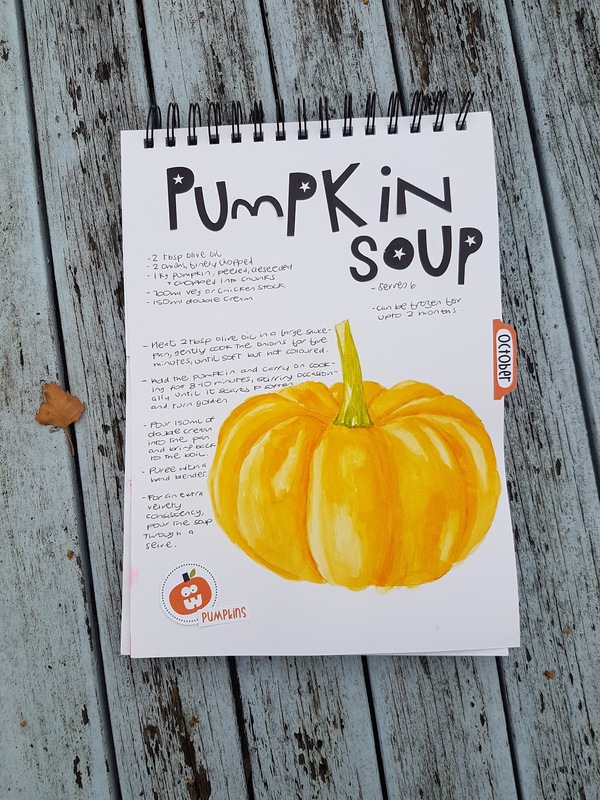 Using stamps felt like a good way to go, it meant I could get creating a page, building volume and content quickly. All without the fear of how it would look, once it's down, it's down, no faffing back and forth about placement. I have quite a collection of stamps, but there were a few Autumnal activities which I didn't have an appropriate stamp for, so I doodled a few in there too! 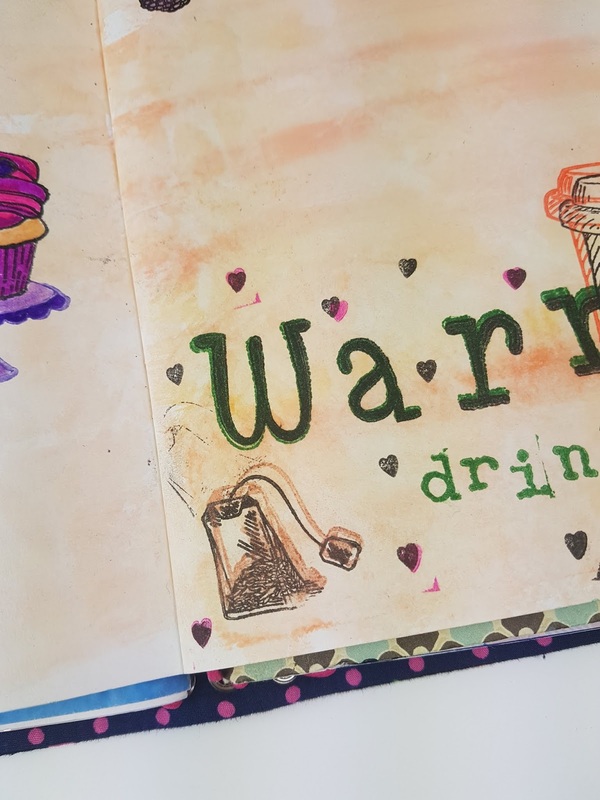 After getting stuck in with the stamping and colouring in, the creativity just kept on coming. This little lady came to mind after looking in the mirror. I often wear my dreads in a bun on the top of my head when I'm creating as they have a tendency to fall into paint, glue, glitter, whatever it is and the result is always a mess! J made the joke once that my dread bun looks like a cross between a pineapple and a pumpkin, and he's right. Cartoony style art is something I'm really getting into, I'm not very good, I still really struggle with the looseness of it, but I'm getting there! I used a mixture of watercolour paint and pencils to create the texture of her hair and then outlined her using a 0.3 waterfast pigment liner. 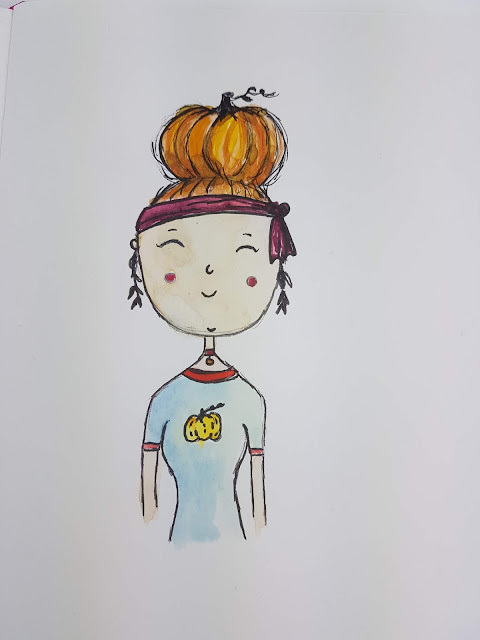 I felt she was missing something so I gave her some pumpkin leaf earrings too match her hair. I want to work a little more on faces so I'm going revisit some of Anna's early Patreon content where she gave some tips and tricks for drawing sketchy girls. Hi everyone, wow it's nearly Christmas, time flies! 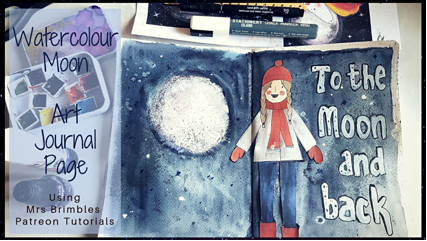 Today I have been playing around with a few things from Anna Brims Patreon goodies to create a Wintery themed art journal page. I'm in love with this page, the colour, the texture, the mood, it all sings to me and makes me warm and fuzzy. 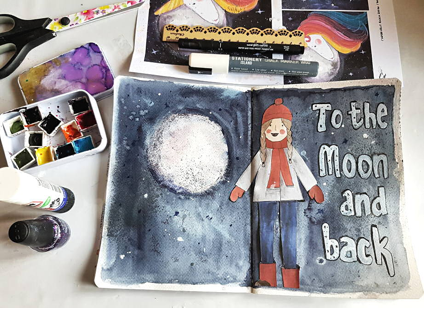 For the page I followed a video tutorial of Anna creating a moon page like this one, but with a painted unicorn... you can get this as a collage sheet and I tell you now, it's stunning (you can see a sneak of it below in the photograph). 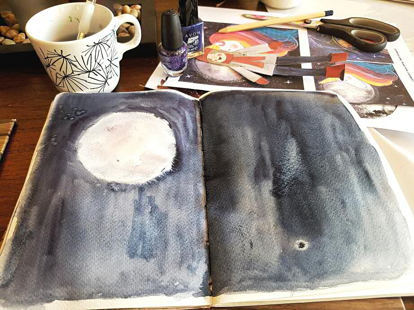 I used my Daniel Smith watercolours firstly to paint the moon and background. I'm not going to go in to the how's here - you can see for yourself on Anna Brims Patreon Page. Anna then suggested using nail varnish to add sparkly texture and oh my word I love it, it really makes the moon and sky stand out. I then added a Prima Spray mist to really give the sky texture. I did have to be careful here as the spray mist does have a mind of it's own and I always feel it sprays a bit too much. However the result here was just what I was going for. I then added one of Anna's cute Autumnal girls which I cut from a collage sheet to really make the page pop. She's so cute. I must say the collage sheets this month are amazing. I can't wait to use the rest of them now that I finally have some printer ink. Lastly I finished off the page with a quick quote using a white paint pen and outlined it all and added shadow using a fine uni ball pen. I'm really liking the page and I will definitely be using up my old and unused nail varnishes in my art projects again. I must warn you though it did pong quite a bit whilst I was creating the page. Thanks for reading the post, I promise I won't leave it as long next time. Now my ink here is here there will be no stopping me with the collage sheets. Hey everyone, I hope you're starting to feel festive, I definitely am. Jingle and Mingle helped, but my daughter constantly singing carols from her Christmas play has got me ready for the festive season. I've been trying to keep my December memory keeping simple. December is busy in my house as I'm sure it is in yours, so I didn't want to set myself up for failure by creating unrealistic expectations of myself. I've been making a list each day (see #30lists on instagram) and decorating them with my Christmas ephemera. 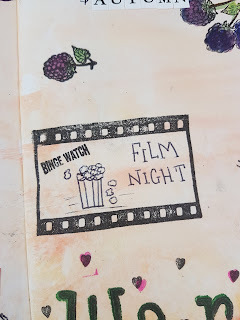 Anna has some gorgeous collage sheets this month and they were perfect for this project. 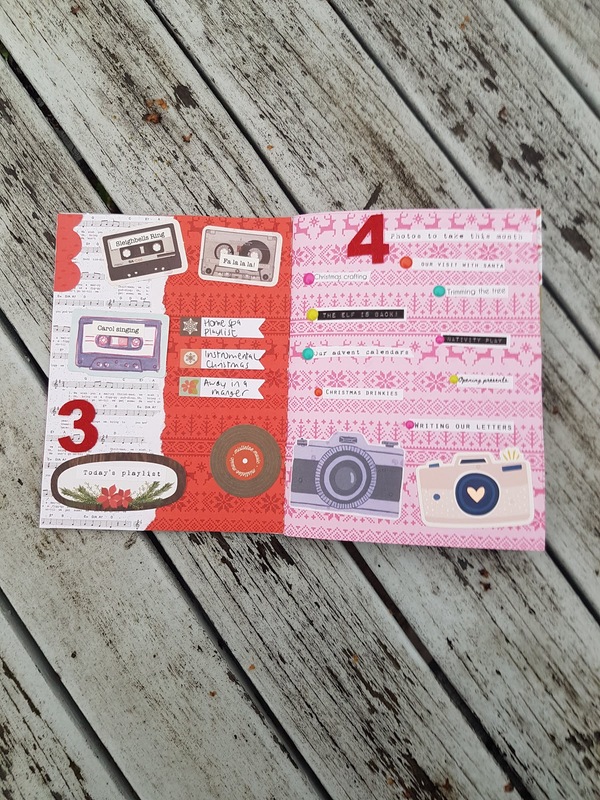 There's a page of festive words, which I just love and I used on this page to list the things I wanted to take photos of this month. 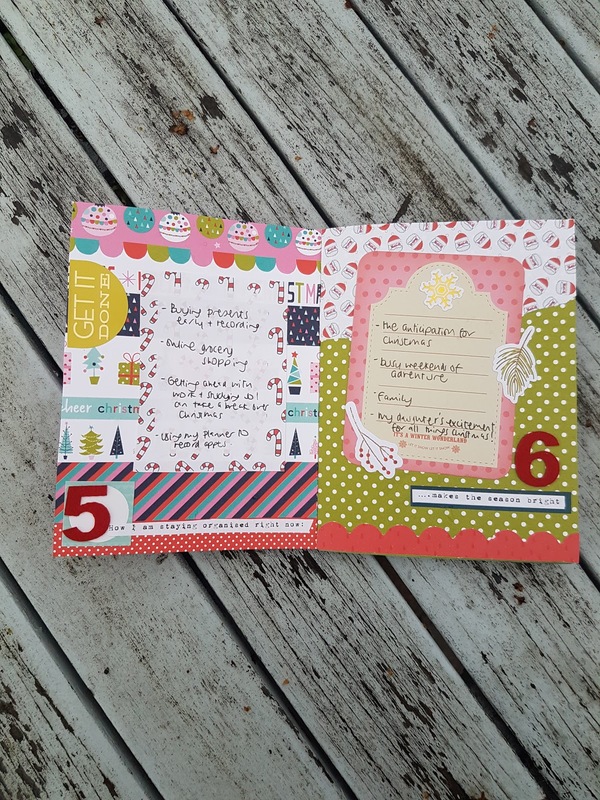 There's also this lovely father Christmas paper (I've torn and glued it to the top of page 6) and some little journalling cards which have been perfect to write my lists on (here on page 5). I hope you're finding time to create this month, it's important to do something for yourself in this season of giving. 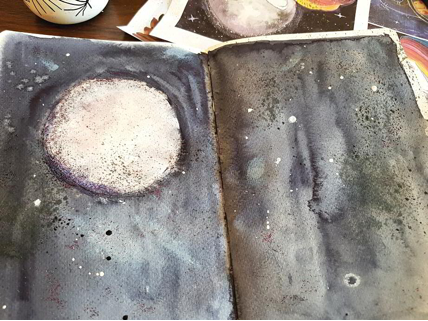 Don't forget to check out Anna's Patreon which includes all of Anna's beautiful collage sheets as well as art tutorials. You can find more of my art here, on my blog, or on Instagram. 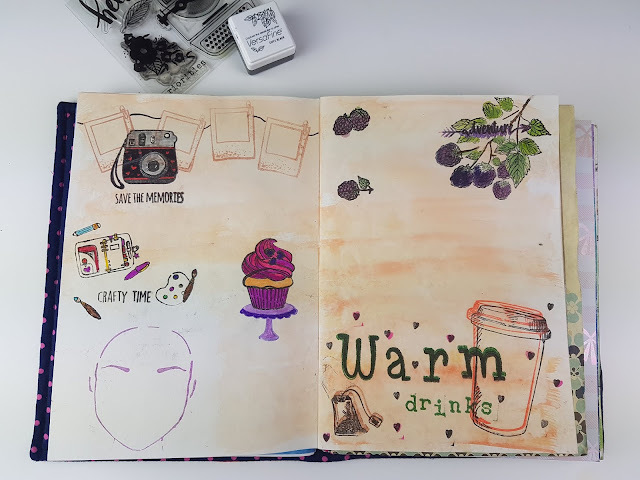 It's been a while since I played with a LOT of coloured washi tapes and I have to say, it was a lot of fun and I really enjoyed it. There's nothing like pops of colour to really brighten your day. 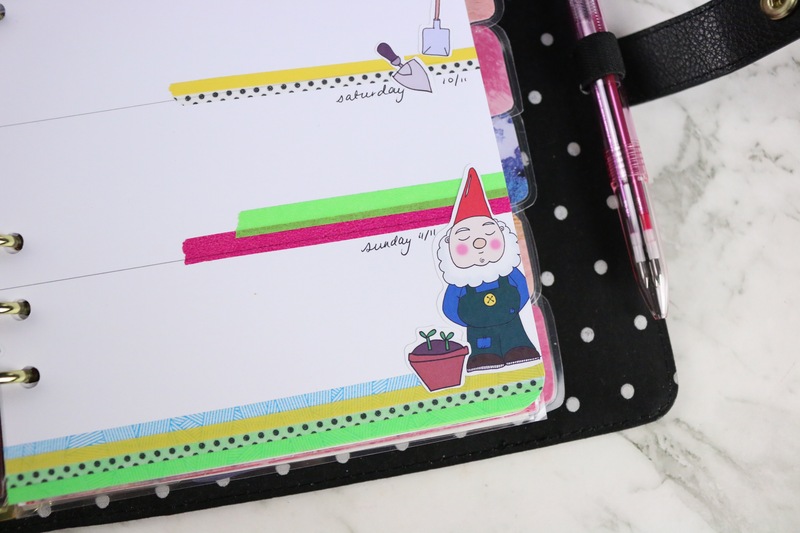 I find it impossible not to look at this layout without smiling, because everything about it is so cheerful, and that's exactly what I need at this time of year when everything starts to get hectic in the lead-up to the holidays. I wish I could say I had a formula to where I placed the stickers, but I honestly don't (and I'm pretty sure I break a lot of design rules, too... but hey, rules are meant to be broken, right?). I just wanted to make sure I not only had a pretty layout, but a functional one, too, with plenty of room for my to-dos and upcoming events. My horizontal layouts always have eight boxes - the eight being for a 'notes' section. Which in my layouts is always more decorative than 'notes' (because that's just how I roll! ), and it's position in my layout tends to fluctuate depending on how much space I need. So this week it's in the middle of the week and I really don't mind that! 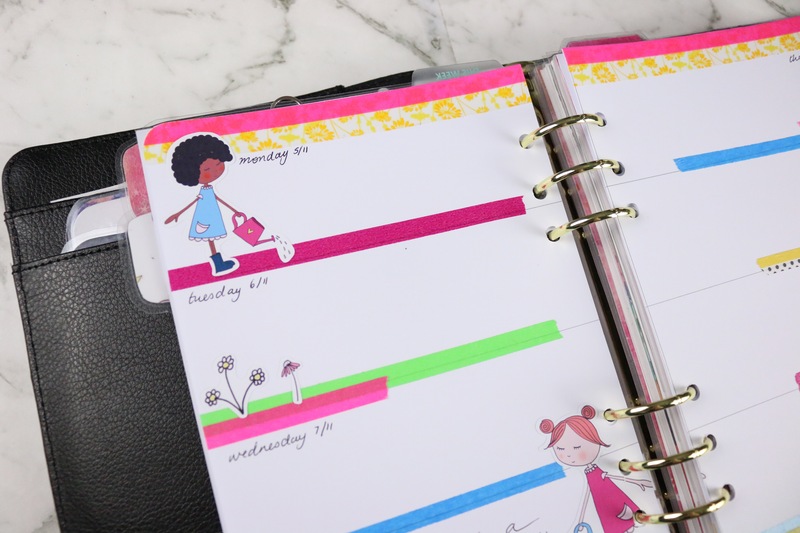 I hope that wherever you are, you are being inspired and living your best life, and that your planner helps you to do that. 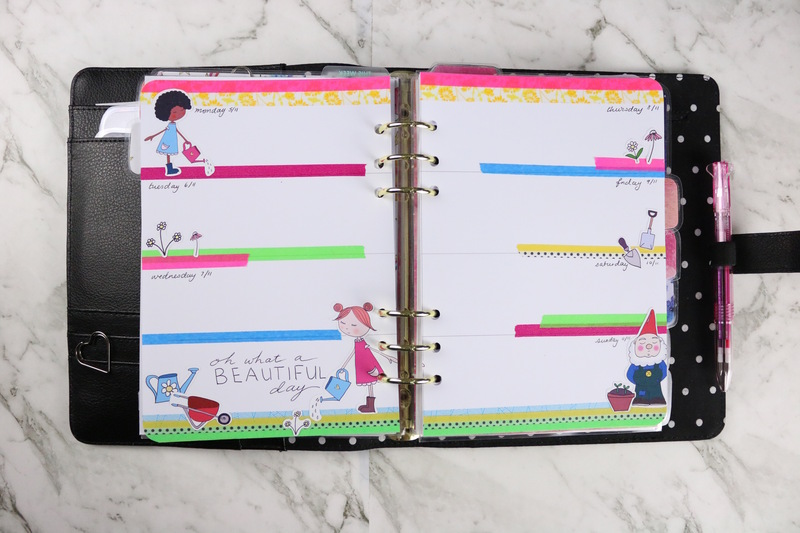 If you're looking for more planner inspiration, I post planner videos every week on my Youtube channel.